We’re pleased to offer the beautiful Jeanne d’Arc Living Magazine is a 95% advertisement free monthly lifestyle magazine filled with creative DIY ideas, simple recipes, captivating articles and beautiful photography of inspiring homes, vintage flea market décor and crafts, nostalgic European garden designs and flower arrangements – all in the French and Nordic romantic decorating style, featuring a beautiful light filled pale aesthetic. Never miss an issue ! 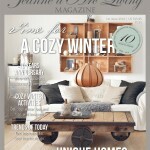 Are you interested in a recurring subscription of Jeanne d’Arc Living magazine ? We can send your subscription issue of the magazine out to you, as soon as it arrives from overseas. Ring us on 0408 788 648 to arrange (please leave a message for us to return your call) Or email us (find email links on the Contact Us page).. We can begin your subscription with the month you wish to begin and continue for as many issues as you want to add onto your subscription. We offer options to prepay for the whole subscription up front, or to have each issue payment charged as it arrives and is ready to post. Subscriptions include post. Just let us know what you wish when you ring to subscribe. Shipping rate of $5.00 will be added (for post to addresses within Australia only), unless the magazine is being shipped with other items purchased, in which case, flat box rate for destination applies. Shopping Cart will select the correct rate.